In the anime, primarily ep2 when Kirino first come to Akihabara, I noticed many of the brand name or billboard was altered, リバティー/Liberty was changed into ワバチィー/wabaty, タカラダ/Takarada to タカダ/Takada, ガシャポン to ガチャポン, Laox to Taox, Labi to Labla, Gee! to Guu!, McDonald's to McDoneld's etc. I wonder why they made such changes. 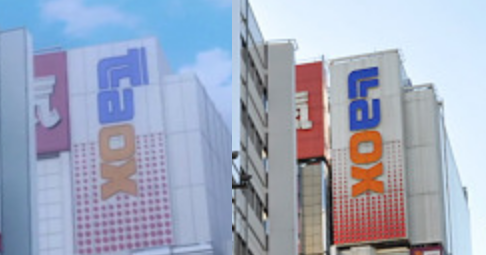 They could have kept all the brand and billboard the same as they are in real life, but instead, they made so many subtle changes (while the maid cafe remains almost entirely intact). Since many of these easter eggs are placed in a very obvious position, and animating such a complicated background asks a large amount of effort. I don't really believe these are purely the animator having fun. Are there any other reasons? Like copyright or advertising? P.P.S. image retrieved from this website. TV Tropes has an entire page dedicated to this phenomenon: Bland-Name Product. Replacing brand names is a fairly common phenomenon in media. As Dimitri mx mentions, this is probably because the studios want to avoid using trademarks to play it safe. This is why parody names like "WcDonalds" and "EcDonalds" are so common in anime. 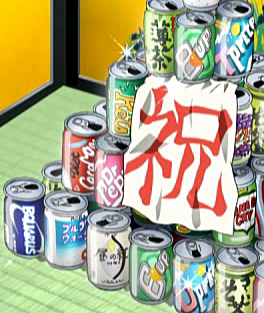 Sometimes the anime actually does use the real names, if they get the product placement properly arranged behind the scenes. For example, this was the case with Pizza Hut in Code Geass. (Hence the "Pizza Hut supports the Rebellion" memes.) 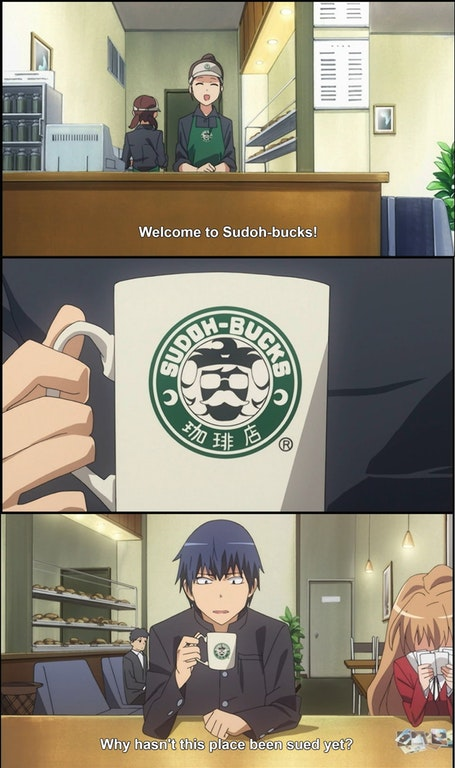 For more detail, see Have there been any anime with actual product placement? However, taking the steps to formally arrange this kind of thing requires more effort and comes with more risk, so I can see why anime productions tend to go with the less risky parody names. For example, consider High Score Girl. 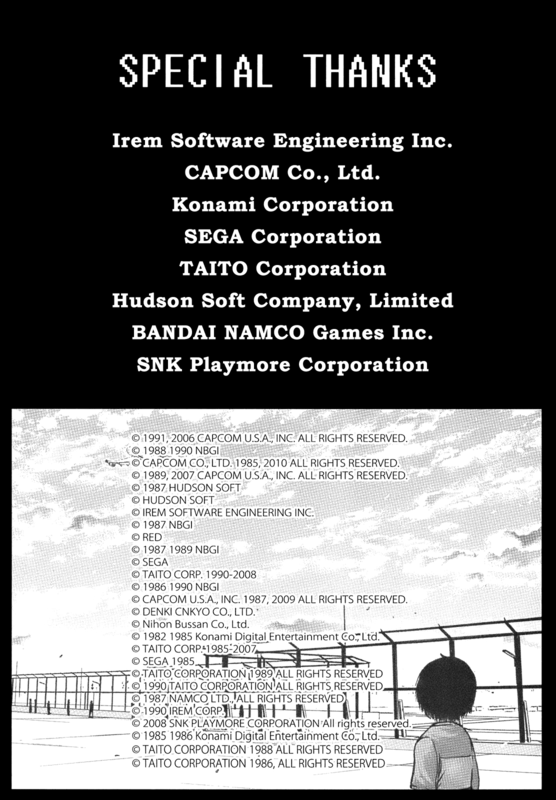 This manga got into legal trouble because it directly featured lots of 90s video game content, even though its publisher, Square Enix, took steps to secure formal consent for the use of the games' characters from the various companies. In 2014, SNK Playmore launched an IP violation claim against Square Enix because of this manga, which resulted in the recall of all the volume and digital publications of the manga. It took about a year before the two parties reached a settlement and the lawsuit was withdrawn. Not the answer you're looking for? Browse other questions tagged oreimo or ask your own question. Which of the OreImo endings followed the light novels? Why did the “until we graduate” provision enter into the ending of OreImo? Who is the new girl in Kirino's group? Is kuroneko from Oreimo considered dandere? Are the Oreimo light novels different from the Anime? Where did the Haganai and Oreimo cameo appear? Which is the song Kanako (Meruru) sings?